Choose from 3/16" Coroplast, 3/16" gatorboard and 3mm dibond in sizes up to 48" x 96". Sizes larger than 2' x 4' can not be shipped. Please call for more information. Corrugated plastic yard signs available with or without frames. Bandit Signs, Real Estate Signs, Jobsite Signs. 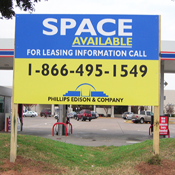 Magnetic Car Signs are inexpensive advertising tools that produce great results. Any size, square, round or oval. We make reflective magnetic signs too. Use these inexpensive vinyl decals indoors or outdoors. Square, Round and Oval shapes in many sizes. Small or large - Any size. Nylon Reinforced Vinyl Banners are great for special promotions. We also have several banner stands to display your banners. You'll be amazed by the wide range of products we can print on including posters, vinyl, banners, artist canvas and plastics. Computer Cut Vinyl Lettering and Graphics install quickly. We stock many colors and special purpose vinyls including fluorescent, foils and reflective. Full Color Business Cards printed on Heavy 14pt Card Stock with Glossy UV protective coating. A-Frame Sidewalk Signs boldly display your message. Changable panels make these a great option.